This centre spread in the BILD newspaper led the German, Austrian and Dutch media onslaught telling Turkish voters to vote NO in their referendum on constitutional change (in both German and Turkish). A YES vote would see a separation of legislative and executive powers in Turkish governance, both currently in the power of the Prime Minister’s Office, and Recep Tayyip Erdogan could thus consolidate his presidency. BILD, owned by the media giant Axel Springer, is the largest circulation newspaper anywhere outside East Asia. The question has to be asked why this newspaper told Turkish voters that the founder of their new Republic, Mustafa Kemal “Atatürk” (pictured) would have voted NO in this referendum. After all Atatürk shaped Turkey with a programme of forced migration of over 2m people based on religious identity. Christians relocated were unsuccessfully integrated in Greece, while tens of thousands of Muslim Greeks were forced into Turkey against their will (Bedlek 2016). The few Greeks left in Istanbul exceptionally were heavily regulated in a 1932 parliamentary law to limit their freedoms and were subjected to numerous pogroms. Understanding what Atatürk was up to confuses many. Was his insistence that Turkey be 100% Muslim to be defined as a religious or an ethnic policy? As Balkan nationalisms chipped away at the Ottoman empire in the second half of the 19th century, migrations of refugees to Anatolia consolidated Turkish Muslim identity and Abdülhamid II’s policies used this as a nationalist banner to rally a faltering empire (Zürcher in Kerslake, Öktem and Robins 2010: 55-68). Atatürk was part of an élite officer corps trained in France who carried out a coup against Abdülhamid in 1908 to stem the empire’s decline. He was an inveterate anti-monarchist and French intellectuals today love him and revere him as a revolutionary Jacobin. But Atatürk’s ideas were formed from those of August Comte, who taught many of these officers at the Paris École Polytechnique though not Atatürk himself. It was Comte’s ideas about “rational religion” that he sought to apply to Abdülhamid’s legacy. Atatürk would end up consolidating Islamic practice into a moral code that was rationally explained and deemed to be a genetic Turkish characteristic. In 1980, General Kenan Evren and Fethullah Gülen would call this Ataturkism, an ideology of state under the supervision, soviet-style, of a “Directorate of Religious Affairs”, which didn’t allow for variations in belief (like the Alevis) or ethnicity (like the Kurds). The straightjacket of Ataturkism and its aggressive policing is what lies beneath today’s divisions in Turkey and the political psychosis of what Kerem Oktem calls an “Angry Nation“. Atatürk ruled through a single party, the Republican People’s Party (CHP), which is the current bitter opponent of the Justice and Development Party (AKP) founded by Erdogan in 2001. The multi-party system which stuttered forward from the 1930s onwards, being a French idea, was deemed “good” and therefore necessarily one which the Ataturkist (or Kemalist) élite sought to emulate, although they didn’t know how to. When after single party rule, Atatürk’s successors instituted change, a continuous stream of opposition parties would start and would then invariably be closed down soon after, when judged unsuitable by a tutelary military. So Atatürk, albeit an iconic figure who wrested the Turkish nation from imperial aggression, was hardly a paragon of tolerance and democracy. Why then did BILD feature him in this way? Was it some kind of message? It certainly looked ominous. The clue, I believe, comes in the announcement by Bruno Kahl, head of Bundesnachrichtendienst (BND), Germany’s spy agency, in the run-up to the referendum. In this announcement and in Kahl’s opinion, the Pennsylvania-based cleric Fethullah Gülen was declared not to be behind the 15th July 2016 attempted coup in Turkey. What is particularly interesting is how Kahl says this. He is not putting forward an analysis of events or in any way producing the results of a forensic examination about Gülen’s personal role in the affair. He is making a political statement about the Gülenist Organisation as a whole (called FETÖ by the Turkish government which deems it terrorist) when he says that ‘... it is a civil organisation that aims to provide religious and secular education’. This is in direct contradiction to what Stuart Smith at the US Consulate in Istanbul had said much earlier (revealed in the Wikileaks cables), which compares the Gülenist Organisation to a mafia organisation. Stuart Smith had not been minded to extend Gülen a US residence permit (at the time). As it turned out, Gülen would nevertheless aquire residence through the intervention of certain figures in the CIA, in particular ex-director Graham Fuller. Stuart Smith’s assessment was echoed in several independently published books by journalists Ahmet Sik (in The Imam’s Army), Nedim Sener and Soner Yalçin as well as former police chief Hanefi Avci (in The Simons Living on The Golden Horn which parodies the infiltration of the police and judiciary by Gülen and the lack of attention to it, by comparing this to the pollution in the Bosphorus which sightseers at the time ignored while picnicking). The irony is that all these writers were arrested on trumped up charges by prosecutors that belonged to the Gülenist Organisation because of their revelations about them. Now exonerated, they have recently been released. As to Gülen’s personal involvement in the attempted coup on 15th July, the Turkish government point to the testimony of Armed Forces Chief of Staff General Hulusi Akar who, when approached by members of his staff involved in the coup, was offered the opportunity to talk to Gülen on the phone. If, however, Gülen’s personal involvement is simply put to one side, there still remains the fact of an organisation whose members referred to each other in Turkish terms that were distinctly associated with the Gülen movement, which, besides, transcended the armed forces to involve large categories of civil society. This organisation was beyond doubt directly connected with the July 15 attempted coup. All these facts would be uncovered by Turkish intelligence (MIT) after thousands of these members of the organisation used the Bylock messaging app to communicate with each other, revealing their identities as a result of the amateur nature of the encryption on the app. After this was discovered, they subsequently switched to using WhatsApp in order to coordinate the actual attempted coup itself, but WhatsApp was hacked by al-Jazeera Turkey during the events revealed yet further information. Post-coup arrests were made, based the information recovered from both those apps. If, therefore, Kahl at the BND made what amounted to a political statement essentially supportive and conciliatory of an organisation such as the Gülen organisation, nine months after the coup, and mere weeks ahead of the upcoming April referendum, then it was presumably supposed to have some kind of effect on the referendum outcome. Why would Kahl randomly come out of the shadows and say these things? The EU and the German government were clearly against the constitutional amendments and had put out carefully worked legal opinions decrying them as a ‘dangerous step backwards for democracy‘. But before we go into all that, it is useful to understand the role of the press in all this and the link between BILD, the press in general and the BND in Germany. BILD is the tabloid representative of the German political right, and is owned by the Axel Springer Group. Friede Springer, Axel’s widow, is Angela Merkel’s close confidante and personal friend. In the 2005 elections which brought the CDU/CSU to power with Merkel at the head, Gerhard Schröder, leader of the left of centre Social Democratic Party (SDP), complained bitterly of a media stitch up at the centre of which stood Axel Springer and BILD (Ulfkotte 2014: 73-4). In the late 1960s, when German politics were dominated by a left-wing student community angry at the Bad Godesberg capitulation, which saw the SDP reject Marxist principles and the original project of replacing capitalism at its 1959 party conference (predating New Labour in Britain by 34 years), Axel Springer led the charge against the student movement. When student activist and leader Rudi Dutschke was gunned down in 1968, his followers and many in the community at large blamed BILD headlines for inciting the public to violence against him and other individuals in the student movement. Not only BILD, but the entire stable of Axel Springer publications, instructs its journalists to abide by an extraordinary ideological contractual code , which requires them to take the fight to “religious extremism” (however defined by editorial edict), to defend America and “transatlantism”, and to protect the State of Israel. Nowhere is there any reference to “journalistic” values or to the promotion at least of a best efforts approach at truth-telling in all this. This was an organisation born out of an Allied occupation when the Americans favoured federalism with a weak central state as the system least capable of threatening a ‘... private market economy’. Furthermore, that ‘... the only untarnished social forces [after WWII] were from the Left explains why the Western allies imposed a blanket ban on all organised groups after May 1945...’, making it is easy to understand how the political victor of the post-war years had to be the CDU/CSU (Leaman 1988: 37-39). Axel Springer was this system’s mouthpiece. Udo Ulfkotte’s book Gekaufte Journalisten is finally coming out in English after a three-year delay (after having been published in most Eastern European languages). It describes the pervasive influence in the press of the BND, and its subservience to the CIA. As editor of Frankfurter Allgemeine (FAZ), Ulfkotte’s description of the sheer extent of the BND’s interference in what, unlike Alex Spinger newspapers, was an independently owned and edited newspaper is astonishing. The BND would rent rooms near the paper’s offices where their own staff would write the stories Ulfkotte admits he had to accept and publish wholesale (Ulfkotte 2014: 24). He goes on about the BND’s ‘... pervasive influence on literati, musicians, publishers or public broadcasters’ (198), a fact corroborated by many, including the retired head of German broadcaster ZDF, Wolfgang Herles. If Ulfkotte’s description of how the BND operates is correct, an announcement like that of Kahl suggested a coordinated effort was underway by the BND to influence the outcome of the Turkish referendum through the media, with specialised “boiler-room” operations dedicated to the effort. The overt campaign against the YES camp, which included ARD TV broadcasting in German and Turkish, was therefore accompanied by a covert one. European institutions waited in the wings to weigh into the fray in the aftermath of the referendum result in the event of a victory for Erdogan and the YES camp. Within an hour of the result, which saw a 51.4% win for YES out of 49.7m votes cast (from a total electorate of 58.3m), the Organisation for Security and Co-operation in Europe (OSCE) declared the campaign unfairly biased towards the YES camp. Various EU institutions made rapid fire announcements demanding transparency: this, from organisations that (like BILD) give Israel unconditional support and call the apartheid state “the only democracy in the Middle East”, and which support the current Pinochet-like régime in Egypt. Only the arrogance of the people involved makes them blind to these contradictions. This nevertheless does not absolve a Turkish government which does not abide by democratic norms. The accusations of the OSCE were echoed by the CHP, which wanted to declare the referendum null and void, or at least seek to undermine its credibility internationally on the basis of ‘no smoke without fire’. In terms of the campaigns themselves, the OSCE judgement focused on the mass rallies within Turkey and local TV coverage. On the other hand, no account was taken of either satellite TV as a whole, or of the massive impact of the social media campaign in which the German boiler room operations had a special hand. Social media would be especially important for the wealthier communities that traditionally voted for the CHP, were smartphone savvy, and were open to the idea of voting NO. As it was, the Istanbulites (51.35%) and Izmirites (68.80%) turned into the backbone of the NO vote - the Istanbulites for their sheer numbers. It was strange that the CHP leader, Kemal Kiliçdaroglu, nominally the leader of the NO camp, all along launched no formal branded poster campaign, despite this being well within his party’s means. Kiliçdaroglu was evidently displeased with the whole referendum idea, from the initial stage at which the legislation was being discussed in parliament, questioning it as he did the legitimacy of these very dicussions from the outset. It was unsurprising that he was the first to launch a complaint with the Electoral Board (YSK) about “unstamped” ballot papers being accepted as valid votes. The YSK informed Kiliçdaroglu that ballot papers unstamped by local polling officers had always been accepted within limits, as long as they were on the right watermarked paper supplied, and hadn’t originated from outside the polling station. After all, the CHP itself had requested the board’s acceptance of such papers in previous elections. But no soorner were the CHP’s complaints filed, social media erupted with pictures of piles of what were supposed to be ballot papers in dumpsters and various other scenes that were claimed to represent egregious breaches of democratic practice. Chatter mushroomed about corruption and betrayal. According to all this, the YSK was in Erdogan’s pocket. The YSK claimed its board had unanimously agreed that it had followed standard practice. In their count, the YSK had set aside 865,047 ballot papers is invalid. I understand from certain sources that a further 20,000 ballot papers are the subject of the CHP and the HDP’s complaints, despite the exaggeration of these numbers on social media. This is small in the context of the overall vote. We shall see when the audited figures come out in two week’s time. However, the CHP’s dogged refusal to accept the results is consistent with their “rejectionist” stance from the every outset and the CHP appears willing to go to any lengths, with the cooperation of EU institutions, to discredit the outcome. The lack of credibility of these institutions doesn’t merely emerge from their policies in Israel and Egypt alone. Richard Youngs sees 2005 (in parallel with the CDU/CSU victory in Germany) as a watershed in EU foreign policy with a move towards securitisation and away from liberal (cosmopolitan) liberalism (2010:2), where the ‘... EU’s external policies are increasingly illiberal... [using] the ostensible principles of multilateralism as a means of shoring up its own relative power in a more multipolar world... [and seeking] containment of, rather than forward-looking engagement with, political Islam’. Youngs’ analysis would prove essential in understanding the EU’s approach to the Arab Spring. There was an epilogue. 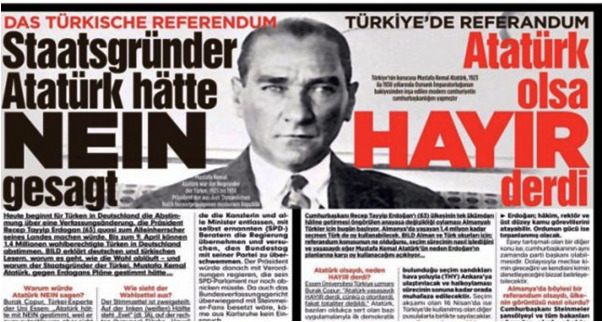 After the Turks in Germany voted 63% YES on a low turnout, Die Welt, another Axel Springer title, published an article which compared the Turks in Germany voting for Erdogan with the Germans in Sudetenland voting for Hitler in 1935. Presumably, this was payback for Erdogan calling the Germans a bunch of Nazis the previous week. Going back to Kahl’s supportive and conciliatory statement about the Gülenist Organisation: what was its purpose? And why did BILD feature Atatürk?